Navigation: Home » Investing » Should You Ignore Inflation in Investment Returns? Should You Ignore Inflation in Investment Returns? No, you shouldn’t ignore inflation in stock returns. Well, actually – when you go to pay taxes on a sold investment… you need to ignore inflation when calculating your capital gains. However, when you’re evaluating your investment performance, you better pay attention to how you performed against inflation – considering that simply buying Treasury Inflation Protected Securities would have, you know, protected you from inflation. What’s The Argument Against Adjusting For Inflation? In this piece, he is talking about the NASDAQ, which recently closed at a price level of 5,000 for the first time since 2000. 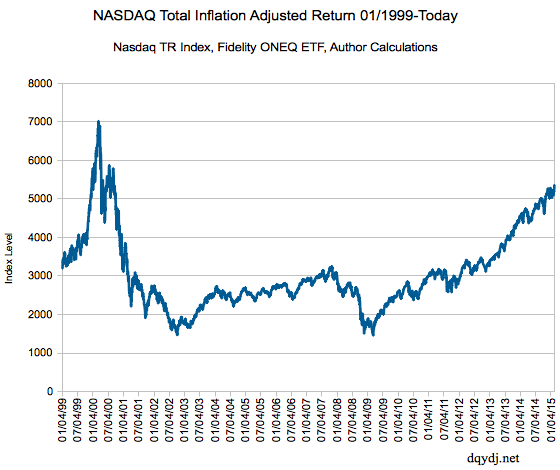 Anticipating the event, we wrote an article where we showed that inflation adjusted and with dividends reinvested, the NASDAQ was nowhere near its year 2000 levels. He argues that people who adjust for inflation (no comments on dividends!) are being shifty, and we shouldn’t insist on inflation adjusting indexes. NASDAQ’s Wild Ride from 1999 to Today- Inflation/Dividends Included! He then explains that businesses, too, have to deal with inflation – left unsaid is that if enough businesses increase prices… well, that’s called inflation. Of the three bolded arguments in that piece, only the first one really makes sense – investors ‘try to get back to even’, they don’t try to ‘get back to even plus inflation’. The second one is a red herring – well, yes, they do… but we’re considering that the NASDAQ didn’t match inflation, that’s why we’re discussing this. The third is true, but it doesn’t really prove anything. Why Shouldn’t We Ignore Inflation When Adjusting Our Investment Returns? Mr. Ritholtz argued it perfectly in the above linked article (even if it didn’t match the title of the piece! ): yes, we should adjust our performance for inflation. Investing in equities is an effort to preserve purchasing power. It isn’t that investors don’t understand that inflation erodes the value of their dollars; rather that is the entire point of investing — to get ahead of inflation. CPI may not describe your life perfectly, and it might not be the best proxy for inflation for you. Still, we deal with inflation in the real world, and we need to make sure that we adequately plan for the loss of purchasing power we’ll recognize over time. If you invested a lump sum in a theoretical NASDAQ fund at 5,000, when it closed at 5,000 the other day you didn’t maintain your purchasing power – no, sorry, you lost roughly 23.48% in terms of purchasing power. That’s a fact – even if you think CPI isn’t a good adjustment, there are other inflation indicators you can use which will give you a similar answer. Inflation is best analogized to a stealth tax on savers. For investors, however, we’ve had a pretty good track record staying ahead of inflation just by buying broad based indexes like the S&P 500. (That link allows you to choose to adjust for inflation or not). Since it’s been about 15 years since the last peak in the NASDAQ, ask anyone who argues that inflation doesn’t matter to lend you money for 15 years at 0% interest. Report your results in the comments (and don’t ignore inflation)! I personally ignore things that are out of my control. Certainly I try to make investments that I believe will outpace inflation, but I realize I have no control over what inflation does.